As part of an exhibition shown in the Central Gallery featuring winning poems from the Friends of the Coleridge Society. Two visits consisted of 4 poets working across Combe, Midford and Waterhouse wards. One poet joined the Stitch in Time workshops and the felt work activity reflected conversations around poetry, Coleridge and other well-known poets. The poets found it a very valuable experience; they hadn’t worked in a hospital setting before and kept an open mind from the outset as some patients were open to the idea of poetry and some were not; in these cases the poets chatted about the patient’s interests and sometimes the conversation came back to poetry or the lives of poets. Two visiting poets wrote poems in response to their visits. respond to Wadsworths ‘Daffodils’ which they had heard in the morning. 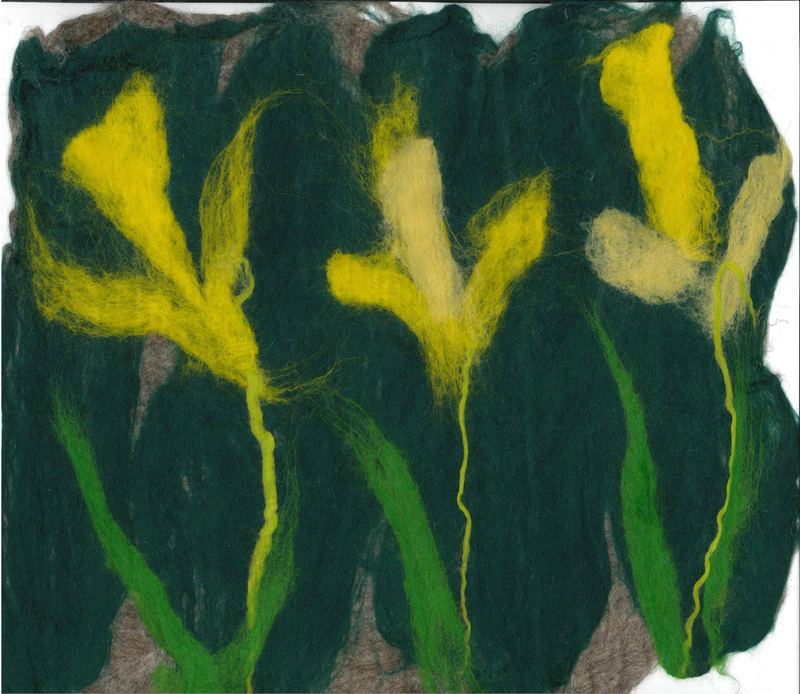 We created two beautiful felt images of daffodils on a rich green background. To date all the felt panels have been abstract. I believe we can develop images now and create pictures if the patient has a particular interest or inspiration. It was no use at all. Poetry? You having me on. I recall a teacher holding a clock. Out in the yard fenced from the fields. Blew dandelion seeds for his clock. And despite poverty, he stayed out of the loop. Nobody trained him to stay in his coop. Against his leg when he was in his yard. He grinned and bore it. He was a card. Ah, but money is nothing and won’t buy you ease. It’s hard to be ill after independent years.